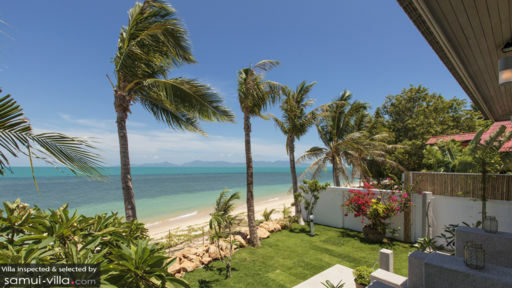 Along the north-eastern coast of Koh Samui, the beautiful and noteworthy presence of Tamarind Beach House is hard to miss. 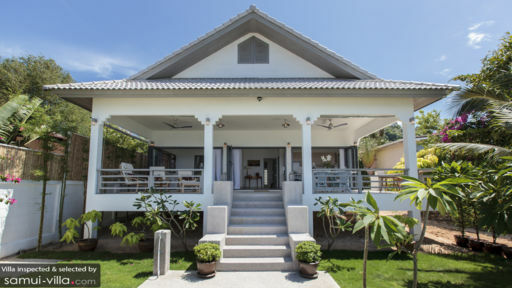 Especially given the proximity to the white sand shores of Bang Por beach, the beach house is all the more alluring to travellers. A home away from home designed in a manner that creates a seamless blend of indoor and outdoor living. The villa features panoramic views of the turquoise ocean as its crowning jewel that can be viewed straight from the gardens, two bedrooms, and even the terrace. A charming holiday home echoing old-world English countryside with stunning palm trees, rock boulders, framing its periphery, and rich flora enhances your tropical experience. The two bedrooms at Tamarind Beach House are bathed in a most surreal white from walls to furnishings with only the a few trinkets to bring in a bright spark of colour. The bedrooms are furnished with a double bed and the other one with twin beds. Wicker bed are laden with plush mattresses promising a good night’s rest. Air-conditioned to maintain the temperature, the bedrooms even have large window overlooking the lush flora and can be left open for some fresh air. The European aesthetic is prevalent most in these bedrooms reminding you an English cottage. There is one bathroom with a wooden bench, necessary amenities, and a shower area. The beach house is more a beachfront bungalow with steps that lead down to the garden and subsequently the beach. The villa itself is home to verdant gardens with native plants that grow fondly in the tropical weather. You may just spot a tropical bird or two loitering around and chirping away happily. Blooming bougainvillea flowers and tall palm trees provide the perfect frame to a splendid ocean. The veranda at the beach house is fairly spacious furnished with lovely periwinkle blue wicker chairs, offering alfresco dining, a lounge with recliners, and ceiling fans so you can lounge here for hours gazing at the ocean. Beyond the veranda lies the main living pavilion at Tamarind Beach House that is a large space elegantly designed with pristine white walls, sheer drapes billowing in the wind, beautiful flower arrangements, and a plush white couch. Shelves lined with coffee books and intriguing artefacts are set against the wall. The best part however, comes when you fold back the glass doors and reveal the gorgeous panorama encompassing the ocean, vast skies, and distant islands over the horizon. The kitchen is on the other side of the living pavilion with an open-concept layout, modern appliances to get you going, and plenty of room to move around with ease. The vaulted ceiling is classic European architecture with a hint of Thai culture. The living area is equipped with a flat-screen Smart TV so you can Netflix and chill against an ocean view. Guests of Tamarind Beach House are invited to make use of the stunning amenities at a nearby resort, The Sea, which has a beachfront pool for a wonderful time. The villa itself has plenty of services on offer such as housekeeping and security to keep everything running smoothly. You can request for a BBQ to be set up on the garden and enjoy a sizzling grill beside the ocean. 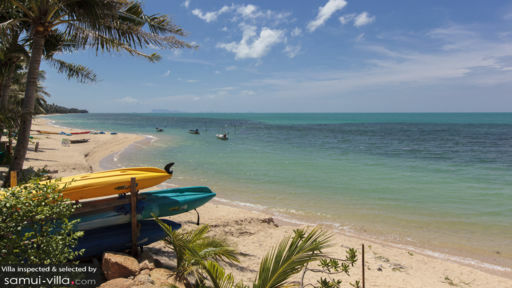 The beach house is tucked away on Bang Por beach which is away from the hustle and bustle of the main towns while also providing you with a place packed with gorgeous sunsets, plenty of water activities, and leisurely strolls along the beach. You can drive down to nearby sights such as Fishermans Village and Chaweng beach with its famous Wednesday Night Market.